I remember this time last year, I was stuck in my corporate job hating the very thing that I loved. Have you ever finally made it to your goal destination and it didn’t feel or look like what you had anticipated? I was finally in my career, but somehow the journey didn’t look the way I thought it was supposed to. I ended up going out on a 6-week stress leave and that’s when I had to rediscover myself and find out what I truly wanted. I questioned the very thing that I felt like I was built for. I had feelings of guilt for changing directions professionally and I felt like I would be betraying my peers if I did something different. I had a serious conversation with God about the direction I was supposed to go in, because things felt as if they were falling apart. Thing is, I knew that there was a shift coming and that I’d be out of this draining full time job soon. But I surely didn’t expect it to happen the way it did. Let’s just say that after spending months exploring what I really wanted my business to look like, a repossessed car and struggling to pay rent, I was separated from my job! I was finally free!!! I had let go of my self-imposed obligations that I HAD to be a therapist, and focused on building my coaching business. I’ve learned so much since my launch and my business has evolved several times over the last 9 months. I set out & conquered the daily mindset shenanigans that come with the entrepreneurial journey. I revamped over and over, until I finally implemented a winning strategy. Your journey is ever-evolving and you must LET GO OF ANY SELF-IMPOSED OBLIGATIONS. One of the major lessons I have learned is to embrace the journey! Because without all of the failures, disappointments and frustrations, I wouldn’t have been able to develop the greatness that I now hold. I now see how every set back was a set up for greatness!! I now help entrepreneurs conquer emotional & mental challenges that are affecting the productivity & profitability of their business. But had I not overcome those internal challenges, I would have never manifested the external rewards. So today, I encourage you to embrace the journey, because without the journey, the destination is meaningless. Candace M. Gray M.S. is a Entrepreneurial Coach. 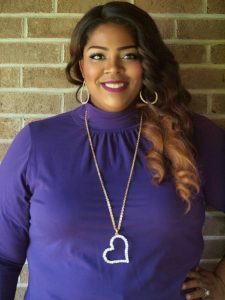 With a background in Mental Health and Social Services, she has learned to take her therapeutic skills and apply them to the entrepreneurial world. Candace now helps other entrepreneurs conquer the emotional & mental challenges that are affecting the productivity and profitability of their business. Candace has inspired countless people to live their lives to their fullest potential, obliterating fears and walking in confidence.